Atheist shoe maker, Atheist Berlin (fantastic looking product, btw), sent 178 packages to 89 people in different parts of the U.S., each person receiving one package prominently branded as ‘Atheist’ merchandise, and one not. As a result, the atheist branded packages were, on average, 3 days later in arrival than the non-atheist marked packages. But that’s not all. They were also 10 times more likely to disappear! For those who live in the U.S., particularly in the bible-belt, this probably comes as no surprise. But it’s still a fascinating study. The “atheist marking” was apparently a packing tape similar to the kind you might see with “fragile” marked on it. Instead, it had the Atheist Berlin logo, which is the word “atheist” followed by a solid black circle. As an epilogue the company says it will no longer use the atheist tape to seal or mark packages and, instead, send them plain brown wrapper. Its a shame that they cannot use their logo, especially since they appear to be a solid, quality product. I only just discovered the shoe line and may one day end up with a pair myself. 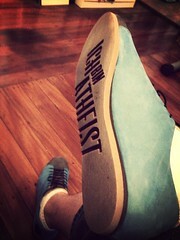 The soles have a reverse of “ich bin Atheist” embossed so that they leave that phrase wherever you walk. Another version has “Darwin Loves” on the bottom. If you end up with a surplus of Atheist tape, you can send it to me in the states. I promise not to stick the end to the door handle of a post office, put the roll on a stick, hold it out the window of my car, and drive around the post office until the tape is gone. This entry was posted in Culture Wars and tagged atheism, atheist berlin, Atheist Study, Darwin Loves, United States Postal Service. Bookmark the permalink.